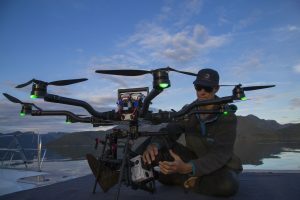 I was hired by the world renown wildlife photographer Ian McAllister, director of Pacific Wild to act as their Chief Drone Pilot for their IMAX documentary on the Great Bear Rainforest. Pacific Wild is a non-profit located in the heart of the Great Bear Rainforest on Denny Island. They are committed to defending wildlife and their habitat on Canada’s Pacific coast by developing and implementing conservation solutions in collaboration with First Nations communities, scientists, other organizations and individuals. Andy Maser working on balancing the camera. I was brought in on this project to assemble, pilot and maintain the Freefly Alta 8 heavy lift drone with MoVi M15 gimbal. 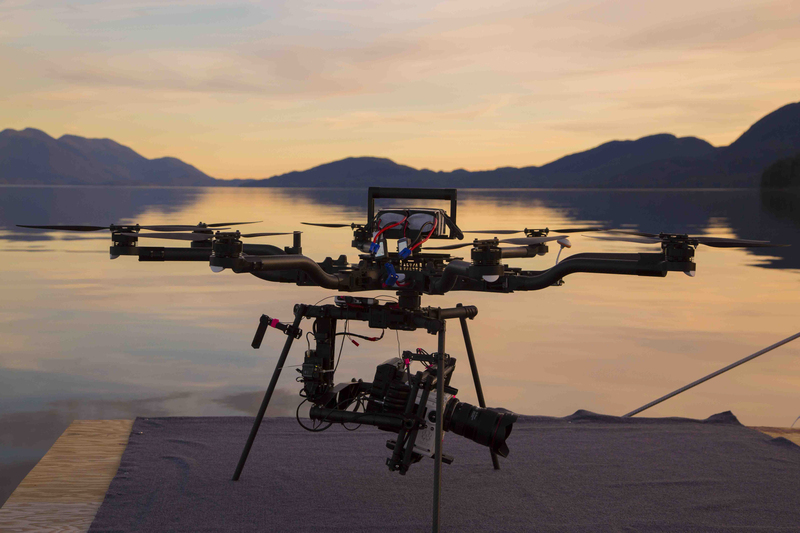 We would be flying and filming with the RED Epic Dragon 6K camera and the RED Helium 8K camera as we were luck enough to get our hands on a pre-release in July. Nothing like contemplating flying a $150 000 UAV drone system on the wild west coast of BC. Near the end of July I flew up to Bella Bella to setup and get acquainted with our new home; a 46 foot catamaran called “Habitat”. I was joined by Andy Maser, a National Geographic filmmaker who would be our RED technician and my camera operator for the drone system. 1) Unpacked and inspected all drone components and back up parts. 2) Charged and inspected all UAV Lipo batteries. 2) Partitioned components into main UAV use and drone backup, labelled and packaged in respective groups. 3) Assembled Alta drone with correct vibration isolators to make it suitable for heavy weight lift. 4) Installed receivers on Alta and bound them. 4b) Checked prop bolt tightness on Alta 8. 6) Configured app and osd preferences. 7) Installed fpv for pilot. 8) Set up monitors on tx’s. 11) Set low voltage warnings and RTH parameters. 1) Test flew without MoVi for 2 hours. Measured motor temps of the octocopter UAV on all landings. Recharged all lipos and check cell health. Downloaded and checked all flight data. Tuned Alta 8 flight parameters. 2) Balanced Red Epic Dragon and video downlink on MovI M15. 3) Linked MoVi controller to MoVi. 4) Set up CONNEX video downlink and verify video out and MoVi.control. Changed MoVi parameters for smoother operator control. Added RT Motion Latitude for camera control while in the air. Added Fool Control App. These 2 lovely add ons made filming with the RED Dragon and the RED Helium easier and much more enjoyable. 5) Tested movements and responsiveness on the ground, modified MoVi controller for cam ops preferences. 6) Experimented with longer lense stability…50-90mm. 1) Mounted MoVi, weigh it and recalibrate Alta flight parameters for weight of 38 lbs. 2) Tested shots with this camera. Evaluated and fine tuned. Used various lenses. 3) Flew different movements/speeds to refine precision. 4) Measured engine temps on all landings. 6) Downloaded and check all flight data. 1) Worked with camera op and spotter to establish consistent standard protocol, communications and movements for drone and drone/camera combos. 2) Looked at options of different launch and landing platforms. Built landing platform on Boat. 3) Practiced hand catching Alta for emergencies. 1) Tested in the field over land and along beaches: jibs, dollies, 45’s, pans, locked, pushes, pulls etc. 2) Refined combo patterns with camera op. 3) Experimented with longer lense stability…50-80mm for active and static locked shots at altitude. We were lucky to be one of the first to receive our Alta 8’s directly from Freefly at the beginning of July. First impressions were very positive. I really fell in love with the new design and portability of the Alta 8. The engineering appeared to be superb with many weaknesses addressed from the previous model; the Cinestar 8. This machine is a beast, even fully loaded I felt that it had plenty of power in reserve. It really felt like a high end machine which gave me comfort and confidence while flying this $100000 camera system. It flies like no other, with serious control, power and stability combined in a beautiful design to to give the ability to create some unique and exciting shots. The toad in the hole, and the top mounting system were also some great new features to the Alta 8 platform. It is mandatory to have the Latitude and Fool Control app for proper exposure with the RED on the Movi M15 (Although on the MoVi Pro it sounds like they have created a direct link with RED so this may no longer be needed). As a wrap up, I should mention that we had the pleasure of renting out an IMAX theatre in Victoria, BC to view our edited footage and actually see the differences between the video that we got from the DJI Inspire, RED EPIC Dragon, RED Helium 8K camera, and the Arri Alexa. Watching the footage on a giant screen with edited sequences and sound design was surreal to say the least. Most satisfying part was knowing that we could use the RED Helium to match footage with the Alexa as we moved into the next season of filming. Newer PostFrom a Training Drone to Flying an Alta 8 with a RED Epic Dragon and RED Helium 8K.